When there's a disabled child in the family, how are normally developing siblings affected? According to Kate Strohm, a counselor and health educator, siblings of the disabled face particular emotional challenges that are often overlooked. Able siblings commonly struggle with feelings of isolation, grief, anger, and anxiety—and these and other emotional issues can have lifelong effects. 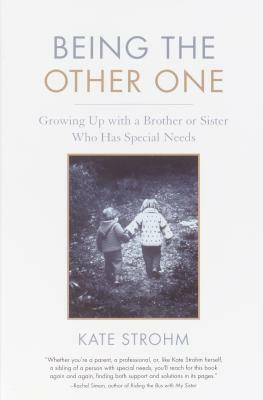 Being the Other One is based on the author's own experience (as a sibling of a sister with cerebral palsy) and on extensive interviews she conducted with siblings of all ages. In clear and compassionate terms, Strohm explores the often secret feelings of siblings and offers valuable strategies for coping with the challenges they face. Being the Other One reveals the difficulties faced by siblings at all stages of life, from early childhood through adulthood, when siblings must often assume responsibility for the care of their disabled brothers and sisters. Though the book looks honestly at the many challenges that siblings face, it is full of encouragement and practical strategies. Strohm emphasizes that when siblings are able to clearly identify and openly express their feelings and concerns—and when parents and health professionals offer the needed support—siblings can thrive. This book includes writing exercises for personal exploration and a substantial resources section listing helpful books, organizations, and websites. Kate Strohm is a counselor, health educator, and journalist. She is the director of Siblings Australia, a program that provides resources and support for siblings of children with special needs, as well as for their families and health care providers. She is a sibling herself to a sister with cerebral palsy.